Espérance Sportive de Tunis duo Franck Kom and Chamseddine Dhaouadi will miss the return-leg of the CAF Champions League final due to an accumulation of yellow cards. 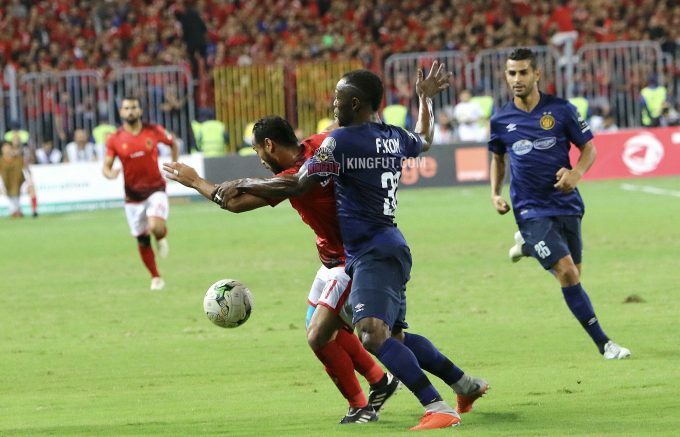 The Tunisian side suffered a 3-1 defeat to Al Ahly at Borg El-Arab ahead of the return-leg which will take place on Friday, November 9 at Stade Olympique de Radès. Espérance need to win 2-0 or by a margin of three goals if they want to clinch the title, however, their mission will not be any easier without two of their starting players, Franck Kom and Chamseddine Dhaouadi. Chamseddine Dhaouadi received a yellow for a foul on Walid Azaro in the 17th minute, which will rule him out of the second-leg as he had already received one against Etoile du Sahel in the quarter-finals. The 31-one-year has missed only one game in this year’s CAF Champions League campaign, when Espérance fell to a 1-0 home defeat to Al Ahly last August. On the other hand, Kom, who hasn’t also missed any of his side’s games in the knockout rounds, will unavailable for selection on November 9. The Cameroon international picked up a yellow card for a foul on Islam Mohareb, which is his second in the knockout rounds after the one he received against Etoile du Sahel in the quarter-finals.